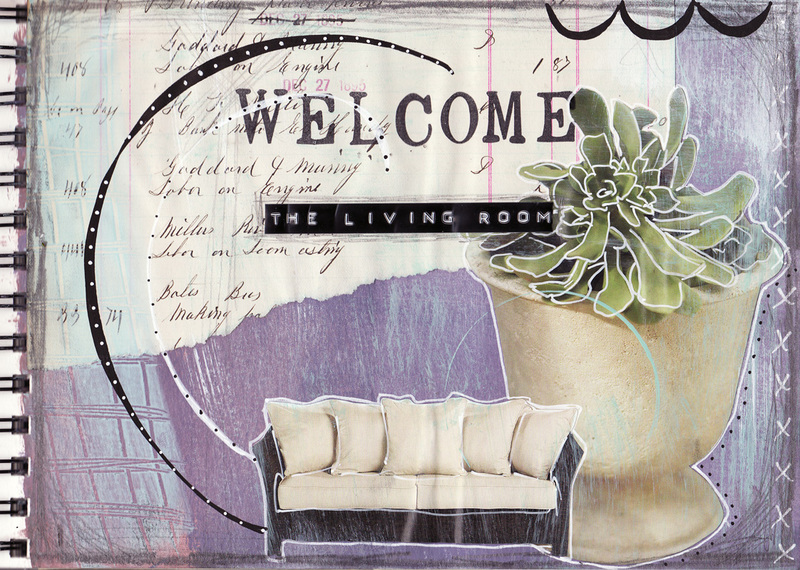 So here we are in a brand new journal. Journal numero dos for me. There are 40 pages in this book, so I'll end up with 80 new paintings when finished. No tearing out allowed! I am using this book for the Living Room. With a new journal, we'll need some great pens, right? One of the most commonly emailed questions I receive is "what type of pen do you journal with?" 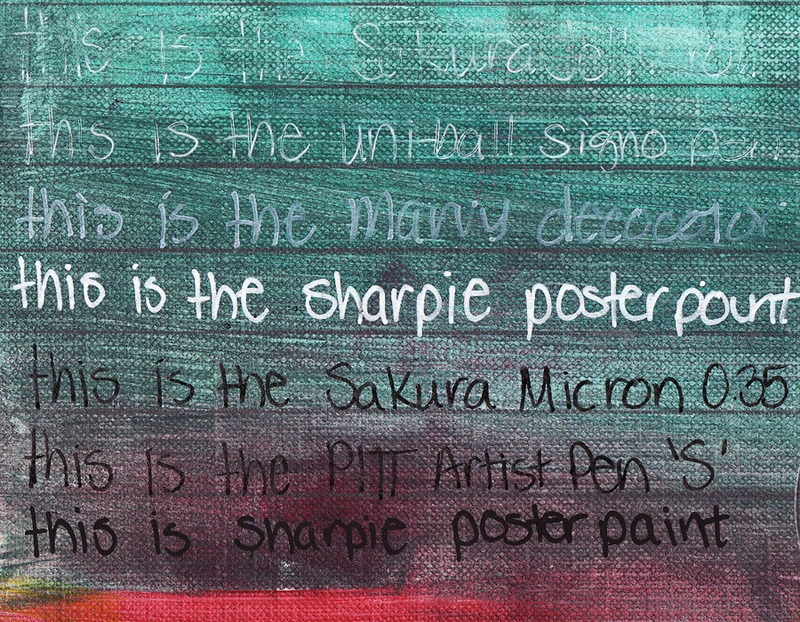 Primarily, I use Sharpie Poster Paint pens. This pen won't work for every journaling "mood". I also like micron pens, an occasional PITT pen and maybe a quill for good measure. Let's put these pens to the test on three different paper surfaces so you can see for yourself! You can click on any/all of my blog photos to enlarge them. 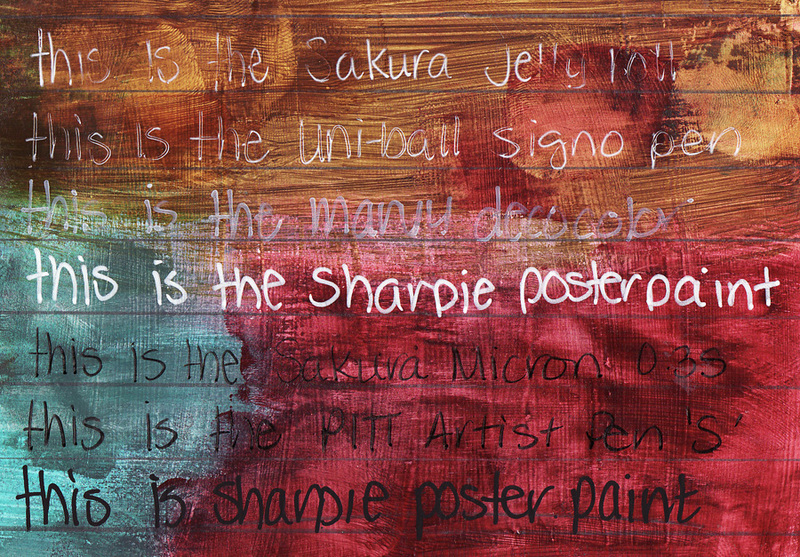 Recognizing that everyone journals on different surfaces, I painted three different paper types with acrylic paint. Each of these papers has a different texture. I tested the following pens on each surface, using my "normal" writing speed and pressure; After all, what good is using a pen that you have to write very slow with or go over the text a second time to get good ink coverage? 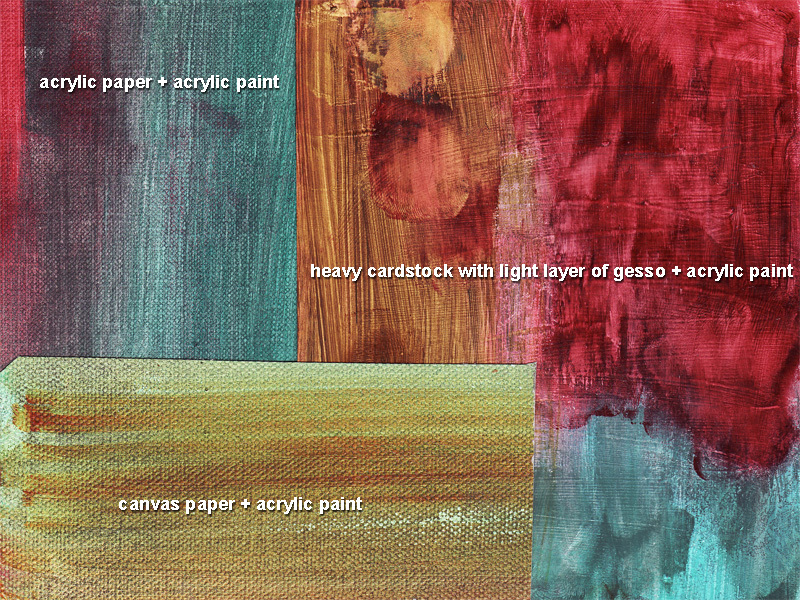 I don't normally use gesso under my paint, but since it is a popular surface to write on I used it in this test. Important to note: the gesso is completely covered with acrylic paint. I have found that like a crayon, the gesso will disturb the pen tips and a lot of the times, the ink flow from the pen will not return to normal. Keep your pens away from crayon, oil pastel and gesso! 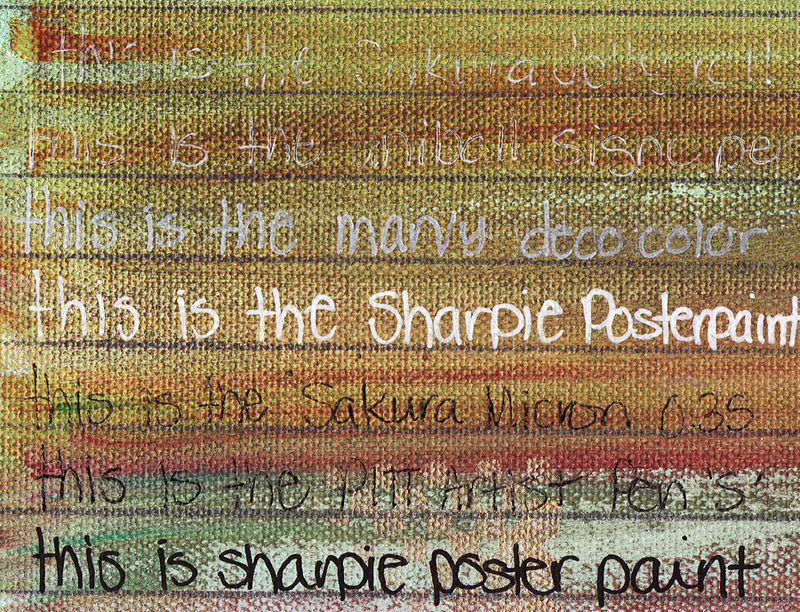 In this sample, Decocolor continues to be too washed out, Signo's ink is skipping and the Jelly Roll is "hit and miss". Sharpie, PITT and Micron work great. When I started my last journal I bought several PITT pens. For my taste, I prefer the 'S' tip. Unfortunately, I have found that unless the surface is completely flat and smooth, the tips wear away pretty easily. They are not durable enough to write on a distressed, uneven surface at all. Recently, I resurrected the Micron pens from my "pen graveyard" and have been pleased with their performance on uneven surfaces. Keeping them away from gesso, I find that these work nicely. All in all though, my favorite is the Sharpie pen by far. Another option not pictured in the test is writing with a quill pen. I use the quill pen on certain projects were an uneven ink flow is warranted. Higgins Black Magic ink (art supply store) and FW Acrylic Artist Ink both work nicely with the pen. Sometimes I doodle with the quill tip and sometimes I write with it. I appreciate your feedback as always...and please continue to keep the comments and questions coming! I appreciate the open dialogue and new friends that come via blogging very much! Until next time, cheers! 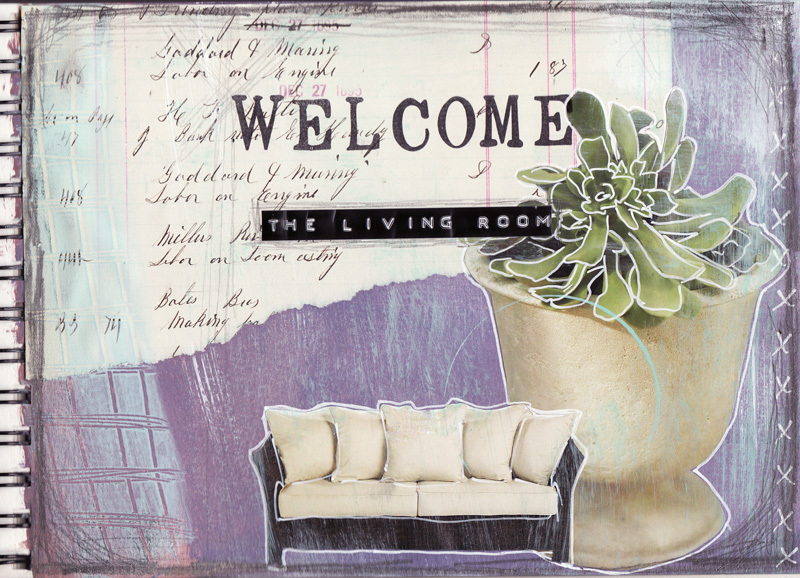 Note: Did you check out The Altered Page yet? Run don't walk...there are some pretty amazing artists being showcased this week!! I've picked up many a new blog feed!